Feel like hurting your head? Listen to these clips of the most atrocious Boston accents ever committed to film. Even when expertly achieved, the Boston accent is a harsh one. To misquote one of its more famous practitioners, “Ask nawt…what Boston can do fawh an actor. 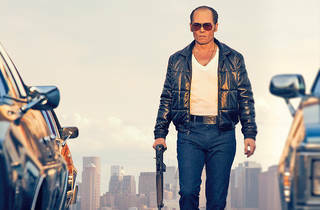 Ask what an actor can do fawh Baw-ston.” Among the most anticipated upcoming movies this fall, the Boston-based Black Mass brings the story of real-life crime lord James “Whitey” Bulger to multiplexes. We run down the biggest stars who have tripped on their way to Massachusetts. Catch Me If You Can is a phenomenal movie and FBI agent Carl Hanratty is one of Tom Hanks's greatest roles, but the actor just couldn't resist slathering his performance with a bit of the ol' Somerville slur (a good deal if he charges by the consonant). Hanks keeps the accent subtle, as far as these things go, but he leans into it whenever he knows he's delivering a killer line: "Knawk knawk." Depp has since had time to improve on his Boston quack—Black Mass isn’t half bad. But in this earlier crime saga, the actor went for intensity over realism, and it shows. Reportedly, Depp cribbed his accent from Aerosmith’s Joe Perry, a guitarist who’s clearly better with crunchy riffs than with words. All the accents in Clint Eastwood's Mystic River are about as believable as the animatronic baby the director used in American Sniper, but Tim Robbins takes the cake (or the Dunkin Donut, as the case may be). Sure, he might have an excuse—he's playing a traumatized character whose entire spectrum of expression has been shaped by an incident from his childhood. But maybe his defining speech shouldn't revolve around the word vampires. Vam-pie-uhs. Playing Kenneth O'Donnell, the Worcester-born Special Assistant to the President during the Cuban Missile Crisis, Kevin Costner apparently decided that the best way to advise John F. Kennedy was to imitate him. Sometimes sounding like himself and sometimes sounding like Mayor Quimby, Costner's accent may not be consistent, but he sure can take it from 0–60 in the span of a single sentence. What can we say? Scorsese can perform miracles, but directing a persuasive Boston accent isn’t one of them. Thankfully, The Departed isn’t supposed to feel wholly realistic anyway, and Alec Baldwin’s hilarious turn as an overzealous detective wins points for mania, if not authenticity. The actor adds about seven unknown vowels to the word microprocessors in this clip. The gold standard of atrocious Mass-accent murder comes via the often extraordinary Diane Lane, whom we hate to criticize. But even in her big emotional scene, Lane’s regional tone is thrown violently like a fishing boat caught in a…well, you get the idea. Who directed her to say “Bobby” like that? German director Wolfgang Peterson, of course. This clip is more exciting for the chance it gives us to watch Martin Scorsese step in front of the camera for a change, as a slimy corporate executive. But Rob Morrow’s crusading lawyer is the one who punctures eardrums: His legal background clearly involves torturing vowels to their breaking points. “Dohn worry, I’m just getting’ staaah-ted,” he assures us, and sadly, he’s correct. Most of the accents in The Town sound rather authentic—director, star and hometown hero Ben Affleck wouldn't have it any other way—but Blake Lively's cartoonish performance as a pill-popping floozy is more Broadway than Boston. When she says "We smoke it ta the filtah, riiight?" it's hard to tell if this is local flavor, or if her character has just had too many Oxys. Voicing detective Tom Craven like he's the lovechild of Will Hunting and Elmer Fudd, Mel Gibson is quite possibly the least authentic thing to come out of Boston since the McDonald's lobster roll. "These guys ahh awhm’d, they were foe-llowin me, reahh-ended my cahh." That sentence is a perfect storm of awfulness, made all the worse by how he fully annunciates armed in the next one.